A few weeks back, I had the pleasure of attending a Vincent Price themed dinner where I met the lovely Lee Clayton Roper author of A Well-Seasoned Kitchen. 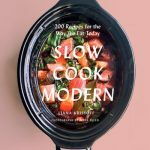 When she introduced herself as a cookbook author, my heart skipped a beat. I immediately asked her what was the title of her book and was so pleased to find out it was a cookbook that had been recently on my radar. 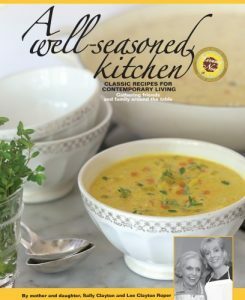 Lee kindly offered to send a copy to me for review and to offer a giveaway to one of my Cookbook Junkies. A Well-Seasoned Kitchen was started because Lee wanted to find a way to preserve her mother Sally’s recipes. The cookbook kicked off with Sally’s participation but sadly, Sally passed away before the cookbook was finished. Lee finished this beautiful tribute to her mother’s memory on her own but her mother’s presence resonates off the pages. 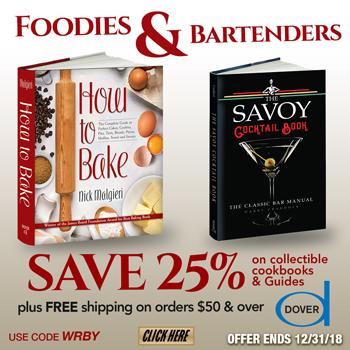 The book provides you with everything you need to throw a fabulous dinner party or a wonderful dinner for your family — from elegant appetizers and drinks to sweet finishes. The appetizers start us off with Cheddar Chutney Tarts, Smoked Salmon on Mini Cheddar-Dill Scones, Melted Gruyere and Bacon Dip and Camembert Saute as a few of the appetizers that caught my eye. Cheddar Chutney Tarts are going to be made the next time we have friends over. 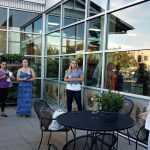 The Breakfast and Brunch chapter offers Sour Cream Peach Muffins, Very Lemony Bread and Deviled Eggs in Madras Sauce and more. There are chapters on Soups, Side Salads, Main Dish Salad before we arrive at the Poultry Chapter. Chicken is a staple in many homes because it is economical and generally liked by even picky eaters. It is a favorite in our home too and this book has so many wonderful ways to prepare the humble bird. Chicken Breasts Stuffed with Chorizo, Grilled Chicken with Lime-Green Chile Sauce, and I was happy to see a recipe for Savory Chicken in Phyllo Packets. When my eldest son was young, I would make a phyllo wrapped chicken dish that he and his friends raved about — “chicken in paper” they would call it – and Lee’s recipe has me eager to try it soon if not for a family meal for our next dinner party. Many more chapters await us filled with delicious recipes. Meats, Vegetarian Main Dishes and Pasta chapters are full of wonderful recipes. The Side Dishes Chapter which offer us Kentucky Corn Pudding, Leek Gratin, Veggie Fries with Lemon-Garlic Aioli, Potato Souffle and Lemon Rice is my favorite chapter! I am all about the side dishes! 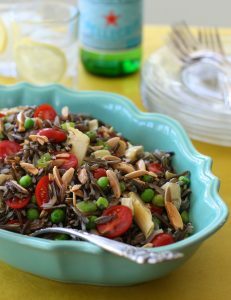 The Elegant Wild Rice Salad looks perfect for the barbecue season coming up and Lee is sharing this recipe with us here: Elegant Wild Rice Salad. The book ends off with desserts as most celebrations and dinner parties do. From simple to spectacular, we have Chocolate Cocout Pecan Bars to Eggnog and White Chocolate Pots de Creme. 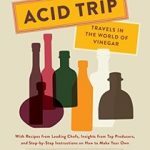 This book has a mix of recipes that the novice and more experienced cook can master. It is a perfect gift for a newlywed or someone just starting out and a wonderful hostess gift. It is the perfect gift for someone who loves to entertain. Lee has graciously offered a copy of this book for one of my readers. The giveaway is open to US addresses only. Leave a comment on this post telling me if you like to throw a dinner party or if the thought terrifies you. A random winner will be chosen on May 27th. Good luck! Thank you Lee for the lovely book as well as offering a giveaway. If you are visiting for the first time, please be sure to sign up for e-mail notices so that you don’t miss a giveaway and also join my group on Facebook — look for the Facebook icon on the upper right. Random Number Generator picked #28 – JUNKIE — congratulations! Would love to be able to host a dinner party. Unfortunately we are very limited on space. I enjoy cooking for people so I make food and give it to friends and my husbands coworkers. So everybody is happy. I Hosted a dinner Party About 10 Years ago. I just hosted a Sunday brunch 2 weeks ago. I love to cook for people, anyone and everyone. I just LOVE to throw dinner parties – or any kind of a party for that matter! I haven’t been able to these last few years, but I am determined to get back to it. Onward & Upward! I enjoy entertaining for small groups of people. I particularly enjoy the planning stages, putting the menu together, deciding on what dishes to use, etc. I’m an innkeeper! I host a “breakfast” party every day!! Love to entertain and throw dinner parties regularly! Gives me a reason to try new recipes and challenge myself! I do love to throw a dinner party … this cookbook looks incredible! I love helping other people host dinner parties. My house is still under renovation, so I help out my friends and go to their house early (with some food!) and help them make sure everything is ready for the party. I think it helps take the stress out of dinner parties, when you have a co-hostess. I will love to throw a dinner party. I host my family for brunches. I just threw a dinner party to welcome my new grandson into the family. He was the perfect guest. I enjoy having dinner parties but just never have the time anymore. I generally host only family parties. I’d love to be able to do more with confidence. I like having dinner parties. They aren’t stressful but I do get a bit nervous as it gets closer. I love throwing dinner parties–both casual and formal. I wouldn’t mind hosting a dinner party, that is, if my husband will cook! i love cooking for friends and family. Searching through my cookbooks for ideas and recipes is my favorite part. I’ve had small family casual dinner parties. Nothing large or formal. We’re having a steak and King Crab dinner party tomorrow evening. I love having company over for meals. I love to cook and have people over many times a year. I love dinner parties. Informal ones. I’m with Jenny, I love sides ! and lately whole grain combo’s with veggies. I love to entertain…so yes to dinner parties! I absolutely LOVE to throw dinner parties, though they are quite casual, with way too much food. Occasionally, everything is timed perfectly to be ready at the same time. Occasionally. LOL If there aren’t enough leftovers for doggie bags, everyone gets a home canned jar of something to bring home. Love hosting small dinner parties. Lately my friends and I are doing more covered dish entertaining. We take turns rotating homes and being responsible for different courses with the hostess providing the entree and setting the theme. I would, because I am a social butterfly. Thank you Lee, and of course, thank you Jenny! We use to have casual dinner parties all the time when we lived in our old neighborhood. We haven’t had any in this new house. Thank you, Lee, for providing a copy of the book for the giveaway. On my wishlist it goes. I love throwing dinner parties for friends and family! I would love to add this book to my arsenal 🙂 Thanks to Jenny & Lee! The thought terrifies me ! I Love to have dinner parties whether it is for 4 or 40.! There is nothing like have friends and family to share food, ideas and stories with all seated around the table. We had 40 children at one time out on the decks because we could not fit everyone inside. Oh What Fun. !!! I’m ok with family but the thought of feeding others …. want to but …..
We are a party household. There’s always something going on here. Now that my youngest is headed to college I’m hoping we can do some more elaborate adult dinners. I’m talking with friends about starting a supper club next fall and this would be a great source of inspiration! I love throwing dinner parties and did prior to getting married 12 years ago ~ positively terrifies my husband ! 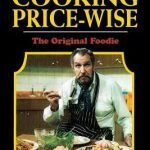 Would love this cookbook to change his mind ! Hooray!!! Thank you, Lee & Jenny!